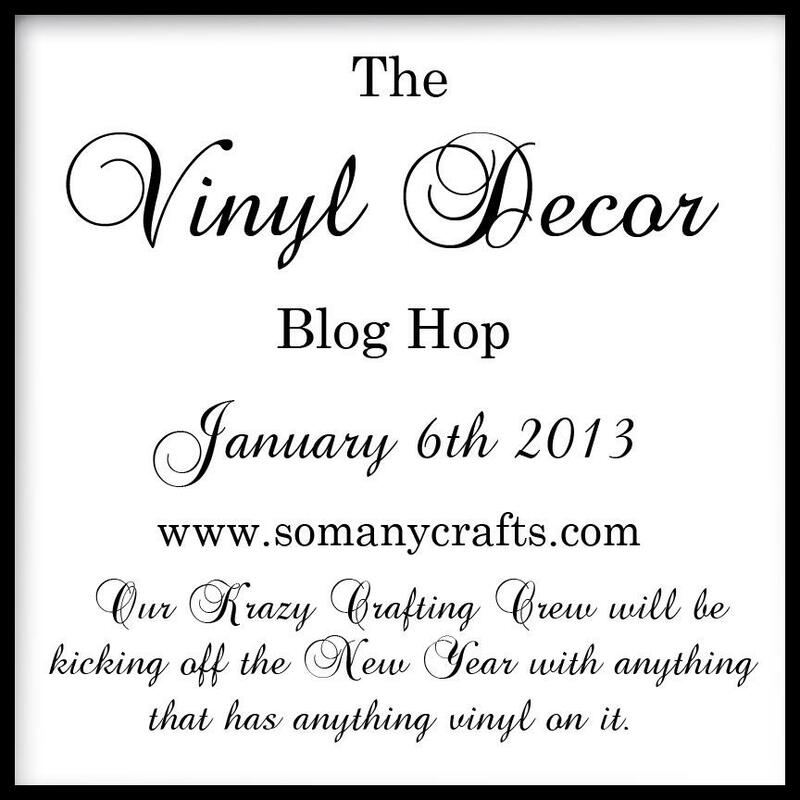 Welcome to the Vinyl Décor blog hop with our Krazy Crafting Crew. A whole new year of themes and more specific projects to inspire you with. If you have just stumbled upon the hop and would like to start at the beginning Lissa Marie is your host at www.somanycrafts.com. She is has given a video tutorial on how to apply the vinyl, and is also doing a vinyl give away so you don’t want to miss out on that! If you just came from Pam’s you are in the right spot, so let’s keep on hoppin’! Just Kidding, I'm your last stop. box frame with vinyl on the front. For this project I used the Believe in yourself word art available in the silhouette store. I think you need to do this, and being your self and I know this has my name all over it. I designed a filmstrip with my silhouette software. And I used a doily cut out. The papers are from Heidi Swapp Vintage Chic line. I choose some pictures that are what I am all about. Being silly and making people laugh. I used some soft pink crinkle ribbon, which is going to be available in my store in a few short days. I inked it with some antique linin distress ink, and misted with some home made gold glimmer mist. I made a double bow and glue dotted it to the kraft colored flourish. I also used a Teresa Collins flower, and inked the edges slightly as well. This flower was on clearance at my local store so I grabbed a basket full of them. I popped up the 4by 6 photo. The filmstrip photos are 2 by 3 thanks to my software not letting me crop them how I wanted. 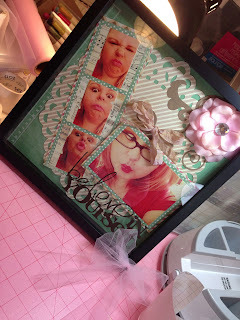 I finished this off with a pink tulle bow on the outside corner. I absolutely LOVE this! Great Job Jessi! Oh I love it!! You did such an awesome job!! Beautiful!!!!!! That's all that needs to be said.I love it. This is fabulous! Thanks for sharing this! I have been thinking about doing one similar for my soon to be 10 year old grand daughter! This is soo cute I just love everything about it. The whole project is beautiful and the vinyl title on the frame really adds to it. I am impressed with your art work. Such a beautiful job. You're an inspiration. I love it! Beautiful layout and the vinyl just tops it off. Great project good for those days that you just don't feel good about yourself. Thanks for the inspiration. Very cute dear but I am agreeing with your mom that it would nice to see just a regular picture of you once in awhile. I like the funny faces especially for this project but I still haven't seen you as you. :) Hugs kiddo. I love this! What a great job and the layout is adorable too! Such happy funny pictures. I like the quote on the front. The project reminds me I have a shadow box of my own to create. Jessi, I absolutely love this project. It's so you! Great job. GREAT job, Ms. Jessi! Now if you only WOULD believe in yourself, you would be much kinder to the lovely you YOU have become! As my granddaughter would say, "You're the best!" Super cute! I think I need to make one for each of my daughters..